The Bitcoin created by Satoshi Nakamoto in 2009 has become one of the popular trading instruments. In early 2017, Bitcoin (BTC) was traded stable in the price range of $ 800 - $ 1,100. But at the end of 2017, BTC was able to reach its highest price at the level of $ 19,891. This means that within 12 months, Bitcoin can grow to more than 2,000%. Until now, there are no other trading instruments such as forex, stocks, or bonds that can provide such a level of profit. The greater the public adoption of Bitcoin, the greater the price fluctuations that occur. If during 2017 BTC was only dominated by Bull, at the beginning of 2018, there were various Bears who pressed the price of Bitcoin. Various ways of trading Bitcoin also emerge, but because the trading principle for any instrument is almost the same, (selling at a more expensive price), the analysis process is not much different from the way of analysis in other markets. Broadly speaking, Bitcoin analysis is divided into 2 types, namely Fundamental and Technical Analysis. Fundamental Analysis is a method of analysis based on issues, rumors, and various events that directly or indirectly have an influence on the performance of a market. Some experts have the opinion that Fundamental Analysis is more suitable to use in making long-term decisions. Technical Analysis itself is a technique used to project trends in prices. This analysis is done by studying market data in the past, such as Price Action and Volume. Technical analysis can be done with various methods such as Price Action, Chart Pattern, or those that use indicators such as RSI, Moving Average, and so on. The analysis of the Bitcoin fundamentals is not much different focusing on factors that can influence the law of demand and supply. As we know, Bitcoin only has a maximum supply of 21 million units. But in fact, it has been ascertained that the supply in circulation will be much less, because there is a Bitcoin that cannot be used by anyone. This bitcoin cannot be used because the private key is lost or for other reasons. In fact, there are rumors saying that the creator of Bitcoin, Satoshi Nakamoto, has locked at least about 1.1 million Bitcoin units in his personal account. Until now, it is known that there are around 4 million Bitcoin units that cannot be used due to various factors. So if we understand further, this fixed Bitcoin Supply is specifically designed so that the value of BTC coins continues to increase. This can happen because along with demand (Demand) that continues to grow, prices will increase if the supply (Supply) also does not increase. Under certain conditions, the fundamentals that arise in the form of news, issues, or rumors can make people lose confidence in Bitcoin and choose to sell their Bitcoin. Thus, these conditions will directly make Supply greater than Demand, and make the price of Bitcoin plummet. Some fundamentally negative related to Bitcoin are usually associated with rejection and blocking from international or government banks, hacking of the Bitcoin platform, and various other negative news that can damage the image of Bitcoin. Some variables such as transaction activities related to the BTC function as crypto currencies and digital assets can affect the Bitcoin Demand. When it was first launched, of course Demand (Demand) for Bitcoin is very small, and its use has not expanded, so the price is still low. But with the increasing popularity of Bitcoin, the Demand for this crypto currency shot up. Besides being able to be used as a medium of exchange, Bitcoin is also an instrument in a trading spot. This can cause demand to increase at any time. For example, there is positive news about the adoption of large companies or financial institutions for the Bitcoin payment system. In this case, the optimism of the wider community about the potential and credibility of Bitcoin will certainly increase, so that the number of Bitcoin buyers will rise. Nature of News: Negative News culminates in the addition of Supply, Positive News can increase Demand. News Source: Only take news from professional and trusted sources. Core News: If it can affect the stability or whereabouts of an instrument, it is worth noting. Subject: Just pay attention to the news that has the subject of prominent people in the world of finance, central banks, monetary, and government. After understanding about Fundamental Analysis, the next method that we must know is technical analysis. As explained above, technical analysis takes the past data to be reviewed and tested again. Users of technical analysis think "Repeated History Itself". There are 3 of the most common and powerful Technical Analysis Methods that we will discuss this time, although there are dozens of other methods that have emerged. 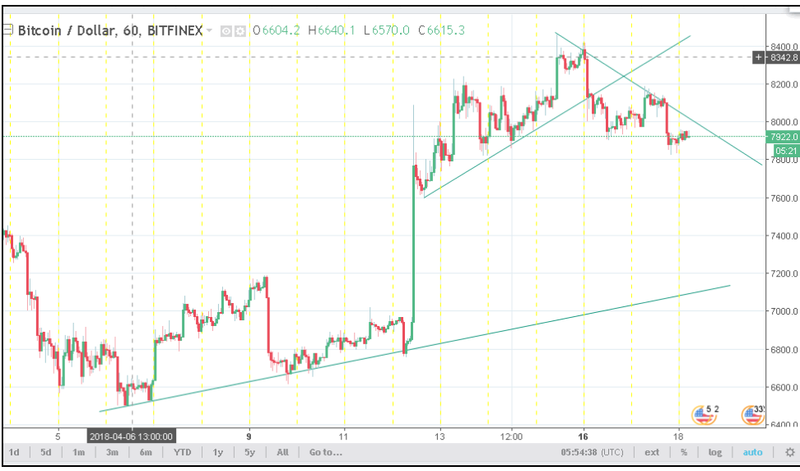 Trendlines or Line Trends, as the name implies, are used to determine trends in price movements that are occurring. The Trend Line can be drawn from a series of Highs that are lower (Lower High), and Low is higher (Higher Low is the same as the Uptrend). 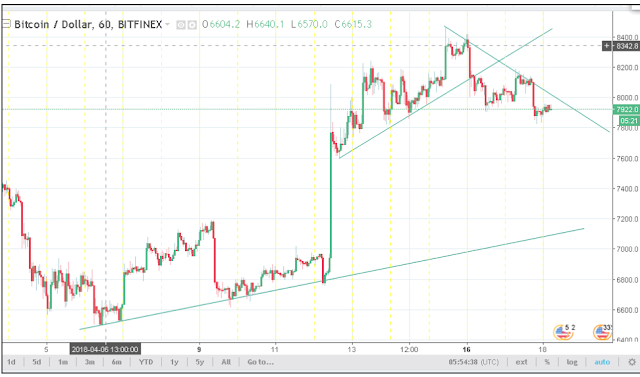 Trend changes can be identified earlier when the price breaks the trendline level. If the trend line uses the slope taken from Low or High, then the Support and Resistance uses a horizontal line at the Low or High level. Levels called Support levels tend to make prices go up again, and become a price barrier. While the Resistance level tends to make prices go back down, and a price barrier rises further. By identifying these level values, we can draw conclusions about where the current coin will be. From the example above, it seems like the Resistance level of $ 8.141.2 is a price barrier to rise further. This is evident from the price that was immediately rejected from that level and decreased. 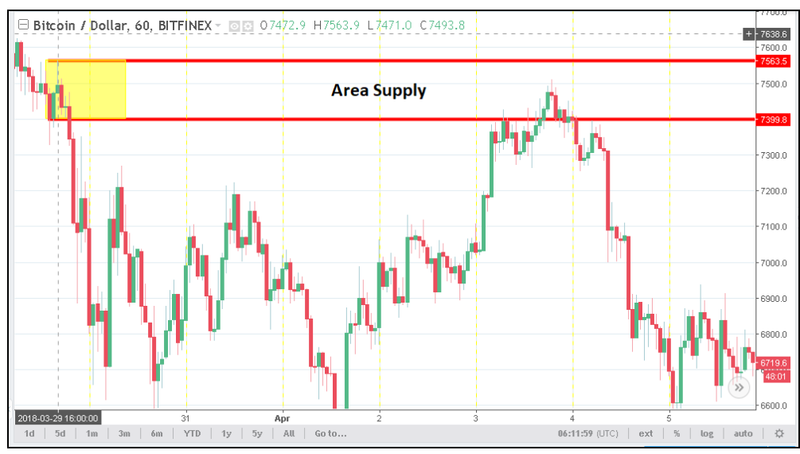 Then the Support level of $ 7,823.0 also immediately provides support for larger purchases, so prices immediately bounce up from that level. The concept is almost the same as Support and Resistance, and indeed it is often identified. However, Supply and Demand here uses the area of equilibrum as the basis. 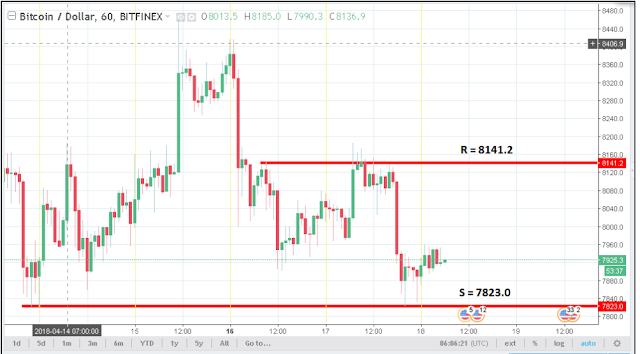 For example, the consolidation area around the level of $ 7,914.7 up to $ 7,815.2 was immediately responded well by the buyer, and prices were pushed up. 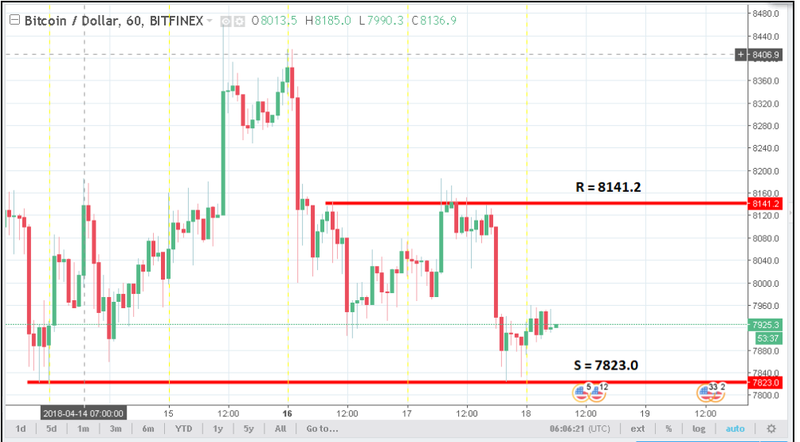 The second example is the Supply area at the level of $ 7,399.8 up to $ 7,563.5 which is also used as the basis of the sellers, so the price immediately falls away from that level. The advantage of using this technique is that we can easily calculate how much risk each order is made. This is easy because we usually put Risk (Stop Loss) outside the area. 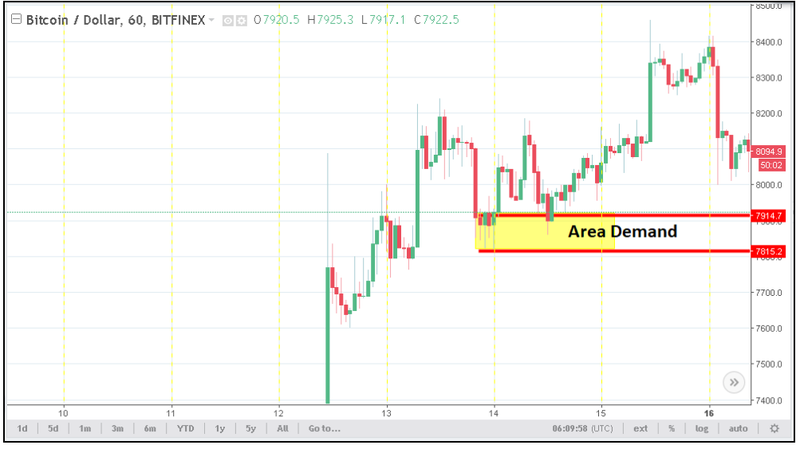 In addition, determining rewards is also easier, because we only need to calculate the amount of price movements with that area.